Have you seen the new pBuzz horn? It's a small plastic stadium-type horn that can change size! Like a trombone, but without a traditional slide, the pBuzz can play simple tunes and is super easy to learn. It's perfect for classrooms, lessons and just plain fun! The pBuzz is supplied with its own trombone-style mouthpiece and requires nothing else to start having fun. 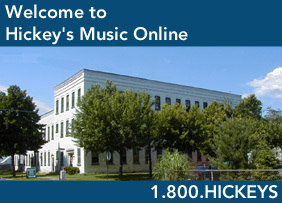 Hickey's is your resource for Solo & Ensemble Contest music. We have music in stock or readily available to meet the needs of dozens of solo and ensemble contests, including those sponsiered by professional organizations, states and music clubs, including (NYSSMA) and others. Chances are we've got your music here for quick delivery! Order your solo and ensemble music now! Hickeys Rock School continues to grow in popularity. Join us to learn how to play in a band, hone your existing skills or take your first steps. With private instruction and band instruction available, Rock School has what you need to learn about playing an instrument in a rock style band, including country, folk and other pop styles. 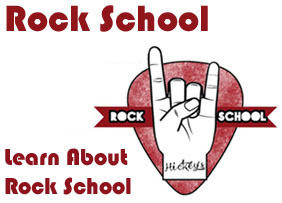 Check out our Rock School here! 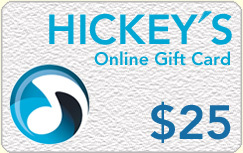 Hickeys is your place for discount guitar strings & accessories, music instruction & song books and of course a nice selection of affordable quality built instruments. Have You Seen Our New Arrivals?! We receive new publications, accessories and instruments all the time, Check out our New Releases section to see what's new. New stuff arrives daily, so bookmark the page and be sure to visit often! Planning to participate in NYSSMA? Hickey's is your NYSSMA headquarters, with thousands of titles in stock and others available via speedy special order. Check out our NYSSMA page. 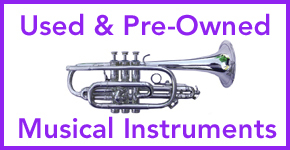 We have a nice selection of used and pre-owned instruments in stock, here presented online for the first time. Here we feature student, intermediate and professional instruments, ranging from Fair to Like-New condition. Check out our Teaching Studio Page section, with lists of standard materials used by a variety of college, university and private teaching studios. Hickeys maintains lists of some of the more popular Instrumental Solo & Ensemble Competitions. Check to see which competitions are in the offing for your instrument and order your materials here. Available in $25, $50, $100 & $250 denominations. Order now for for quick delivery via e-mail. Then just give the electronic "card" to all those on your shopping list! Easy to use, with no additional fees, and no expiration date.Order Now! 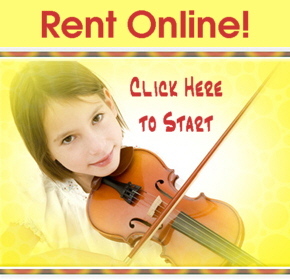 Hickey's Music Center’s popular no-hassle rental plan is now available online. Looking for a particular tune, in a particular key? We can help. Use Sheet Music Direct to find, view, transpose & play any of thousands of individual song titles. Then, print them out right at home! Each tune is 100% legal and prints out on your computer's printer. Click Here to use Sheet Music Direct! Browse or Search our vast catalog and place orders online. You can shop safe in the knowledge that your order is fully encrypted on our secure server and that your personal information is kept private & totally confidential. See us online via Twitter and Facebook. We'll share funny moments, special events, photos of artists when they visit and a myriad of other stuff. No spam, just random thoughts and things you might enjoy!